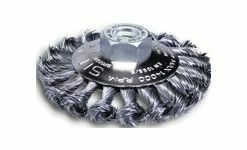 An aggressive brush suitable for removing slags, rust and scraps. The conical shape makes it ideal for bevelling irregular surfaces. For use on a angle grinder.